FAYETTEVILLE, Ark. — Aphids love plants — can’t get enough of them. Nearly every agricultural plant crop and garden is a target for at least some of the more than 4,000 species of aphids that feed on their sap. FLUORESCENT -- Entomology senior graduate assistant Janithri Wickramanayake scans plant samples for flourescence that indicates plant response to aphid attacks. The images on the computer screen show arabidopsis plants flourescing in the scanner. (UA System Division of Agriculture photo by Fred Miller) Credit mandatory. Goggin has received a $115,238 grant from the U of A Chancellor’s Innovation Fund to investigate those very functions. Goggin is approaching this research with crop plants like soybean in mind, but at this point in a complex system, she is using a genetically simpler plant as a model — Arabidopsis thaliana. Also known as Mouse-ear cress, Arabidopsisis a common plant research model because its physiology and genetics are well known and documented. In earlier research, Goggin’s lab identified a mutant genetic line of Arabidopsis thalianathat has enhanced aphid resistance. The resistance results from altered fatty acid profiles in the chloroplast membrane, and the observed activities of gene expression and singlet oxygen suggests they also play a role in greater resistance. Goggin and her graduate students are already using fluorescence and photo microscopy in their research. 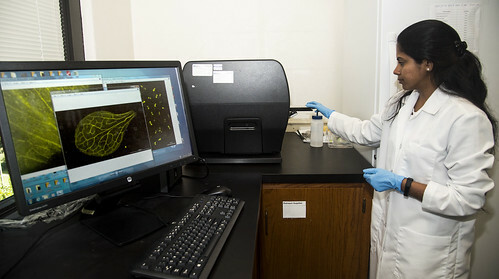 A computer-controlled cell imaging reader in her lab can detect chemical reactions to insect stress in an Arabidopsisplant modified to fluoresce at reaction sites.